I’ll admit it; Ian Fleming’s Bond novels and the resulting franchise of films are one of the guilty pleasures I’ll allow myself. The books that brought the world of 007 to life are, at times, inspired. Get past the shameless and embarrassing womanizing, the low-level racism, and the blatant stereotypes of any non-British character, and they’ve a lot to offer. But what I value most about them is their service as a time capsule. The Bond novels have a remarkable knack for showing what the world was like (from a conservative and British point of view) in the ten or twenty years following World War II. Aside from this, they also showcase some really amazing gear that, today, is immensely desirable; the Ronson lighter, the 1930 Blower Bentley, the Rolex Oyster Perpetual. As a lover of classic machines, I want all of these things badly. And it turns out that Bond used some pretty amazing cameras, too. Since cameras are, essentially, my entire life, let’s look at those. In Fleming’s novel Thunderball, a strategic nuclear strike plane is hijacked with two atomic bombs onboard. SPECTRE, the terrorist organization responsible for the hijacking, declares an ultimatum – they will destroy two major cities unless Britain pays £100,000,000. With the bombs’ location unknown, MI6 dispatches agents across the globe to investigate. James Bond is sent to the Bahamas, a destination he laments will surely be far from the action. To test for stashed nuclear weapons, he brings a device to measure radioactivity, but since he’s undercover this device must also hide its true purpose. To this end, Fleming has his character use a Rolleiflex modified by Q-branch to include a Geiger counter. Bond explains the camera’s secret function to his latest love interest, a woman named Domino who has access to the ship on which Bond suspects the bombs are being kept. Fleming’s novels always held a greater degree of self-awareness compared with their motion picture counterparts, which could be unabashedly cheesy. He seems to recognize and poke fun at his own sometimes silly plot devices. When Domino hears Bond’s big plan, she replies with a laugh. In the film version of Thunderball, Sean Connery’s James Bond carries a different machine to fulfill the same purpose – the Calypso dive camera. More suitably, he uses this camera not only as a Geiger counter, but also to shoot underwater photos of the secret hatches in the hull of the suspected ship through which the stolen bombs must have passed. It’s exciting to see the rare and exceptional Calypso on screen today, and when Thunderball first released in theaters it must have looked like quite the high-tech masterpiece. It was the first successful underwater camera and was built with consultancy by famed oceanographer Jacques Cousteau. Its design was subsequently sold to Nikon, and following the Calypso’s success, the Japanese brand would use the Calypso DNA to develop a range of underwater dive cameras called Nikonos. The first, second, and third Nikonos were based on the original Calypso; the fourth, fifth, and sixth showcased their own incredible Nikon designs. In the 1963 film From Russia with Love, Bond is sent to Istanbul to retrieve a Lektor machine from a Soviet cipher clerk, Tatiana Romanova. The beautiful girl’s desire to defect to the west is regarded by MI6 as an obvious trap, but the lure of a Soviet cipher machine is too great to be ignored. Bond must retrieve the machine at all cost, but first he needs recorded proof of the machine’s existence and confirmation of the girl’s intention to deliver it. And this is where the Rolleiflex again makes an appearance. But this time, it’s neither a Q-branch Geiger counter, nor a camera. It’s a tape recorder, and Bond uses it to record Romanova’s description of the cipher machine. The Rolleiflex needs no real introduction. It’s a veritable legend, used by such amazing photographers as Robert Doisneau, Robert Capa, and the comparatively recently discovered Vivian Maier. It has always been known for its incredible build quality, the impressiveness of its lenses, and the exceptional images it can make. Today, it remains one of the most popular and effective medium format TLR cameras around, and this professional-level machine can be bought today for less than a really terrible digital camera. The novel Goldfinger launches with a dark and gritty tone. Bond is miserable. He’s just completed a dirty assignment that, in the end, required him to kill a man with his bare hands. He’s feeling the pressure of his spy’s life, and is growing tired. The first flight from Mexico to anywhere else is landing at Miami, where he decides to stay for a night of drinking to unwind and forget his hard, cruel life. By chance, he meets a former acquaintance named Du Pont, who tells him a story that piques Bond’s interest. It seems that Du Pont has been cheated at cards by another man, named Auric Goldfinger. The cheated man propositions Bond to discover the method of the cheat and help him win back his money. Bond agrees. He soon discovers the con; that Goldfinger has been winning through the unfair knowledge of his opponent’s hand. A girl, Jill Masterton, watches the opponent’s cards using binoculars from the balcony of a hotel, and transmits the information to Goldfinger via a wireless earpiece. Bond needs photographic evidence of the crime if he’s to motivate Goldfinger to pay back his ill-gotten winnings. For this, he uses what is possibly the most famous camera in the world – Leica’s M3. Bond took the elevator up to his suite. He went to his suitcase and extracted an M3 Leica, an MC exposure meter, a K.2 filter and a flash-holder. He put a bulb in the holder and checked the camera. He went to his balcony, glanced at the sun to estimate where it would be at about three-thirty and went back into the sitting-room, leaving the door to the balcony open. He stood at the balcony door and aimed the exposure meter. The exposure was one-hundredth of a second. He set this on the Leica, put the shutter at f11, and the distance at twelve feet. He clipped on a lens hood and took one picture to see that all was working. Then he wound on the film, slipped in the flash-holder and put the camera aside. This equipment check completed, Bond makes his way to the room in which the girl is practicing her end of the con. He breaks into the room and catches her in the act. While she was concentrating, Bond stepped swiftly across the floor until he was almost behind her. There was a chair. He stood on it, praying it wouldn’t squeak. Now he had the height to get the whole scene in focus. He put his eye to the view-finder. Yes, there it was, all in line, the girl’s head, the edge of the binoculars, the microphone and, twenty yards below, the two men at the table with Mr Du Pont’s hand of cards held in front of him. Bond could distinguish the reds and the blacks. He pressed the button. The sharp explosion of the bulb and the blinding flash of light forced a quick scream out of the girl. She swivelled round. If there’s one camera that is quintessentially suited to James Bond, it’s surely the Minox subminiature camera. A range of unfathomably tiny cameras, these amazing machines are about the size of a cigarette lighter. They’re built like clockwork, operate beautifully, and take surprisingly crisp photos. They’re reputed to have been commonly employed by spies on both sides of the Cold War, and it’s no surprise that they’ve been featured in James Bond novels and films. In On Her Majesty’s Secret Service, Bond uses a Minox to shoot photos of the British girls who’ve been brainwashed to act as biological warfare agents against Britain. Though this didn’t happen in the novel and the methodology employed in the film is baffling (he’s shooting it upside-down and for some reason the viewfinder shows a green tint?) it’s still interesting to see a Minox on screen. Thanks to development houses like Blue Moon Camera, these unique cameras can still be shot and enjoyed today (we’ve got a deep dive story on the Minox coming in the next few months, thanks to a generous donation from the mentioned BMC). Stay tuned. While it’s true that Polaroid cameras lack much of the old-world styling and incredible robustness of the cameras earlier mentioned, the brand is no less legendary. They invented instant photography and captured generations worth of memories. By the 1990s Polaroid’s peak revenue was $3 billion, and its founder, Edwin Land, once held 535 patents. With this cultural impact, it’s no surprise that Polaroid machines would find their way into the pages of a James Bond novel, and onto the screen in a James Bond film. The first pages of the novel Moonraker open with Bond engaged in a training session at a dimly lit shooting range. Here, he must quick-draw to beat a machine that “…sprung the target for just three seconds, fired back at him with a blank .38, and shot a pencil of light at him and photographed it…” Our first glimpse of Moonraker‘s Bond shows him failing. Bond saw that the Instructor was grinning. ‘I don’t believe it,’ he said. ‘I got you that time’. The Instructor came up with him. ‘I’m in hospital, but you’re dead, sir,’ he said. In one hand he held the silhouette target of the upper body of a man. In the other a polaroid film, postcard size. He handed this to Bond and they turned to a table behind them on which there was a green-shaded desk-light and a large magnifying glass. Bond picked up the glass and bent over the photograph. It was a flash-light photograph of him. Around his right hand there was a blurred burst of white flame. He focused the glass carefully on the left side of his dark jacket. In the centre of his heart there was a tiny pinpoint of light. In the 1989 film License to Kill, Timothy Dalton’s Bond is nearly incinerated by a rather ridiculous Polaroid Spectra camera when CIA agent Pam playfully attempts to take a picture of him and Q, played by fan-favorite Desmond Llewlyn. There’s also reference to a machine-gun Hasselblad and some random rolls of Kodak film. These are the kind of laughably ludicrous gadgets that rarely appeared in the original novels, but that seem so cherished by fans of the film franchise. For their part, the Spectra cameras from Polaroid were quite advanced for their day, and are still very usable today, as noted in our review from last year. Grab some film from Polaroid originals and shoot your friends. Just try not to hurt anybody. We’ll end it there, before things get too silly (remember the rocket launching Nikon F?). Know of any other cameras spotlighted in books and film? Let us know in the comments. Thanks pal! This was a laugh to put together. Great compilation, James! I’ve spotted this discrepancy in Thunderball – When Q hands Bond the underwater camera and tells him it takes 8 shots by pressing a button, the camera is plainly seen as a black Calypso 35mm camera with has black gaffers tape covering the name across the bottom. Bond is also given a watch that’s been described as a Geiger counter. Later while on board the yacht, Domino is seen with the camera as she walks in the passageway while using it as a Geiger counter. The camera falls to the deck when Largo confronts her and the lens is seen popping off. We hear the sounds of the counter and see some type of gadgets inside just behind where the lens was. When she bends down and picks it up, Largo takes it from her and the camera is briefly seen with the silver lens re-attached. I had a Nikonos II camera that I bought new in 1971 and used it extensively while diving all over Florida in the early 1970s and in Puerto Rico in the late 1980s. Discrepancy in a Bond film?! Surely you are mistaken! These films are airtight masterpieces. Jokes aside, your adventures with the Nikonos II are what I dream of during these cold, New England winters. Next time I visit Florida you can bet I’ll be bringing my Nikonos. By the way, do you still have the photos from those times diving? Yes I still do. Most were shot with Kodak High Speed Ektachrome 64 (whoa, super fast!) and only my Puerto Rican shots are on negatives. I haven’t scanned my slides yet but they’re on my to do list. I did a ton of Florida cave diving so be sure to put that on your list! Unfortunately I sold my Nikonos a few years back – miss it all the time! By the way, Thunderball and the exploits of Jacques Cousteau encouraged me to become a certified diver in 1969. My “dream” dives were a.) SCUBA dive off of a helicopter as it finds hidden grottos in the Bahamas and b.) Parachute into the ocean in full gear and then dive on a wreck. Obviously both were inspired by Thunderball! Gwyneth Paltrow’s Argus C3 plays a pretty big part in the retro-styled Sky Captain and the World of Tomorrow. 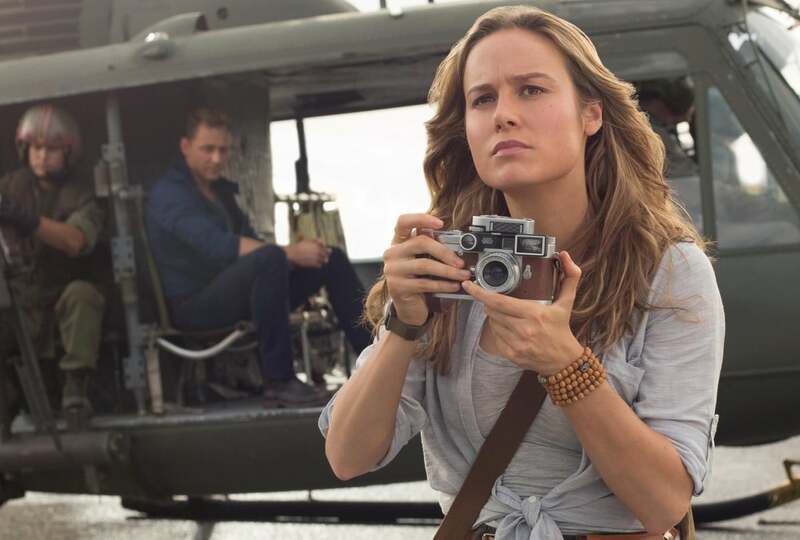 Brie Larson’s Leica M3 has some serious air time in Kong Skull Island. Funny thing is I have the exact same setup, even down to the camera leather! p.s. what is really cool is Brie took a bunch of pics with her personal Canon AE-1 (that she owned since high school!) on the set while they were filming. They really are good. Very cool. Jogs my memory that every time I saw director Rian Johnson promoting The Last Jedi, he was shooting an M6. His Instagram account is full of black-and-white shots from the filming process and subsequent promo tour. Paul from M.S. Hobbies : Minox Specialists. and one you missed: Spy Who Loved Me contains a 16mm Minolta film cassette case. No actual film cassette but it ia referred to as ‘microfilm’.